I have been a Scientologist for 23 years. For 18 of those years I worked as a church staff member in various roles, so I know the organization and its people very well, and I can tell you that this show is NOT representative of my religion, my beliefs or the Church of Scientology itself. I’m writing to express my deep concern about the A&E show with Leah Remini and your advertising during it. This show is blatant religious hate, plain and simple. And the “information” in it is being forwarded by individuals who were forced out of the Church because of their own unethical behavior. Now they are apparently exercising their “right” to make money and get revenge by spreading salacious lies. Perhaps you didn’t think of it this way when you decided to advertise on this show. Perhaps you thought the show had some “merit.” The truth is, you probably have never spoken to a Scientologist or visited a church or read one of L. Ron Hubbard’s books to find out for yourself what it is actually about. You either assumed the criticism was true, or possibly you just didn’t care. But regardless of the justification (or lack thereof), the fact is that your continued advertising on this show is an open vote AGAINST religious tolerance, and FOR religious bigotry and hate. Please try to imagine what it would be like if your religion were being assaulted in this way and how you would feel. Try to imagine how shocked you would be if A&E were to air a show hosted by neo-Nazis who, episode after episode, spewed false and bigoted statements about Jews. I’m quite sure your company would do everything it could to distance itself from it. But that’s only because we all agree that anti-Semitism is hateful and unacceptable. 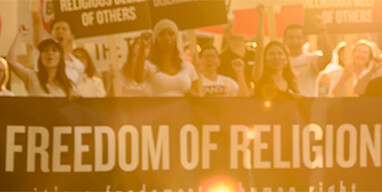 Why not grant Scientologists the same basic right to decency and respect? I am trying to appeal to your good sense with the above points. But beyond that, I want to let you know that I intend to boycott—and do all I can to encourage others to boycott—your products/services if you do not cease supporting, through your ad dollars, religious hate and bigotry.